Mozilla Firefox is 5 years old today. Firefox 1.0 was released on 9 November 2004. The browser quickly gained the adoration of web developers and their enthusiasm spread throughout the world. Firefox has been downloaded more than one billion times and is the world’s second most popular browser after Internet Explorer. (You could make the case that Firefox 3.x is the most-used browser since IE’s market share is split between IE6, IE7 and IE8). Firefox’s history goes back a few years further and it rose from the smoldering ashes of Mozilla’s buggy and bloated browser suite. The project, aptly named “Phoenix”, was started in 2002 by Dave Hyatt and Blake Ross. Their objective was to produce a stable, lightweight, and fast standalone web browser using Mozilla’s Gecko rendering engine. The name was subsequently changed to “Firebird” and finally “Firefox”. Mozilla soon released Firefox was the future and the browser attained widespread awareness with their innovative marketing campaigns. Complimentary reviews followed and people began to realize that Firefox was not only a viable alternative to IE, but it beat the aging Microsoft browser by a considerable margin. For developers and power users, Firefox’s greatest appeal is the add-ons system. The browser was enhanced with extensions that made development easier and prompted the rise of Web 2.0 and Ajax applications. Today, it’s almost inconceivable to develop a web application without Firebug, the Web Developer Toolbar, or many of the other essential Firefox add-ons. Perhaps Mozilla’s greatest achievement is that Firefox changed the IT industry. Five years ago, few web applications were considered viable alternatives to the desktop and Microsoft stated that the web browser was dead. Mozilla’s success prompted Apple and Google to enter the market and Microsoft rescinded on their announcement that IE6 would be their last browser. 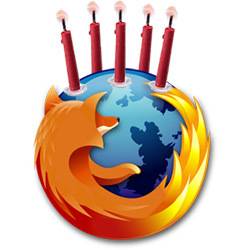 Happy Birthday Firefox! You’re aging better than many of us!